"Look, In the water...It's A Worm, It's A Jig, It's a Crankbait, It's A Buzzbait! No! It's A Spinnerbait! OK, I know it's a corny intro to spinnerbait fishing. But as a kid I loved the old Superman show and I bet if Superman fished he used a "superbait"... the spinnerbait! When spinnerbait fishing, a spinnerbait can be worked like a jig in and around heavy cover because of its inherent "weedlessness", it can be worked like a worm in treetops, along the edges of a laydown and even in and around grass. 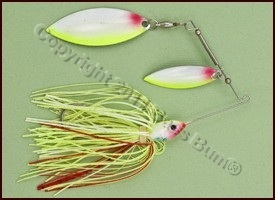 You can "wake" a spinnerbait somewhat like a buzzbait or a shallow running crankbait. A spinnerbait can be fished deep, right on bottom or helicoptered down a bluff wall. It's great along rip-rap and around docks as well. Not only can you fish a spinnerbait in many cover and structure conditions, you can fish it in a broad range of weather and water conditions. Use it in all seasons and when the water is cold, warm, muddy or clear. That's right, I said clear. A spinnerbait is indeed an extremely versatile lure and one I "always" have tied on ready to go. Yep, have one on deck at all times. You'll be glad you do. So, How Do We Begin Our Spinnerbait Fishing? First off we must decide the appropriate spinnerbait to use. "General Guidelines" for Choosing a Spinnerbait. Size - What size of of spinnerbait to use will be determined by water color and the depth where bass are located. What Is the Best Tackle for Spinnerbait Fishing? Their is no one answer to this question as any answer will be very subjective. Anytime anglers compare notes about the rods and reels they use for spinnerbait fishing there will always be disagreement because everyone will swear by what works best for them, in their hands, for any given condition. That's the way it should be. However, just as a reference I'll tell you the various rigs I use for my spinnerbait fishing. For me, since I fish clear water often, I have both a 6'6" and 7' long rods. The longer rod allow me to make long casts when necessary. Additionally, I like rods that are sensitive enough for me to feel even when a bass makes a pass at the bait but doesn't take it. The rods and reels I use spinnerbait fishing are the following. (1) Quantum (QES665F) 6'6" rod, Medium-Heavy, 10-25lb line, 1/2-1oz lures combined with a Quantum Energy Pti (E40PTi) reel, 9+1 bearings, 5.7:1 ratio, 8-12lb line retrieves at 29" per crank. I use 10lb Berkley Sensation monofilament. (2) G. Loomis (SJR782) 7' rod, Spin-Jig, Heavy, Fast, 10-17lb line, 1/4-1oz lures matched to a Shimano Stella (STL4000FB) reel, 15+1 bearings, 5.7:1 ratio, 12-20lb line retrieves at 29" per crank. I use 15-17lb Berkley Sensation monofilament. (1) Shimano (CPC70MB) 7', medium-heavy, medium-fast, 8-17lb line, 1/4-3/4oz lures combined with a Shimano Calais 201 DC (CL-201 DC) reel, 10+1 bearings, 7.0:1 ratio, 8-14lb line retrieves at 31" per crank. I spool with 12lb Berkley monofilament. Where and How Do You Fish a Spinnerbait? You can fish a spinnerbait most anywhere using many different retrieves. Stump fields, flooded brush, laydowns or a tree line beside a submerged fence row provide good woody cover where you'll often find bass. I love an isolated "laydown". A tree which still has its main branches but is absent the many smaller twig branches.. If I find one that is located near deep water all the better. Fish a spinnerbait along the sides of the laydown starting on the shady side if there is one. Retrieve your spinnerbait at a moderate speed down the sides of the laydown making sure to bump limbs. When you do bump a limb and the bait moves over it hesitate and allow the lure to "helicopter" down a ways before resuming your retrieve. Don't make "one" cast. Make repeated casts. If you happen upon a "log", a tree completely without or with but a few limbs, which has one end resting on the bank, fish it. Cast first to the point where the log touches the shore and retrieve the length of the log. If this fails to produce cast perpendicular to the end extending into the water then retrieve past it making sure you bump it as you pass. "Stumps" in 3-5' of water, always good places to find bass, are good spinnerbait fishing targets. If they are located near a drop or break they hold great potential. Cast well past your target stump and retrieve your lure so it "bumps" the stump. Work it over from every angle with numerous casts starting with the shady side, should there be one. You should find bass around such stumps early mornings and late afternoons and most likely on cloudy days. Otherwise you should find them at the break close to the stumps. I don't know about you, but bluffs rarely fail me. I fish them almost year round and spinnerbaits are one of the tools I use, though I approach the bluff spinnerbait fishing differently than with other lures. I try and position my boat right along side the bluff and cast close beside the wall letting the spinnerbait "helicopter" down the wall before starting my retrieve. When the water is clear I'll "burn" a white-on-white (white skirt, silver blades) spinnerbait back just below the surface. If the water is stained I'll choose a more colorful spinnerbait with more chartreuse, a little orange and a gold blade and "slow roll" it a bit deeper staying in touch with the wall as much as possible. If there are small "cuts" in the wall, as there often are, I'll hesitate my retrieve allowing the skirt to flare briefly while continuing my retrieve. Rip rap often holds crawfish and baitfish drawn to the algae that grows on it. Never pass it up. Spinnerbait fishing rip-rap can prove very productive. Fish rip rap by retrieving your lure shallow, close and parallel to the stones initially. If you get nothing move out a bit deeper but continue to fish parallel to the rip rap wall. Lastly, try fan casting sections of the rip-rap bearing in mind that the bottom edge os a rip-rap wall is not straight. There are mini points there that will hold fish. Base the color of your spinnerbait on the color of the water. During pre-spawn, if you're spinnerbait fishing "deep" grass, that is in 15-20' of water, which grows 6-7' up from the bottom, cast over the grass then count down till your lure is at the top of the grass (figure roughly a foot a second drop) and start your retrieve. Use a slow retrieve, don't burn it. My choices of spinnerbaits for grass are a 3/8 or 3/4 ounce with a No. 3 silver Colorado front blade followed by a No. 5 willow leaf, silver or gold (depending on water color), or two willow leaf blades, sizes No. 4 followed by either a No. 4 1/2 or No. 5. Using a spinnerbait, especially heavier 3/4 and 1 ounce versions, to fish docks can be a year round activity. Bass gravitate to docks because they offer shade, cover and opportunity to feed in the form of baitfish, crappie and bluegill which are often attracted by bush and tree "cover" sunk there by dock inhabitants. The shoreline pockets, where the dock intersects the shore are good places to find bass with spinnerbaits. The end of long docks, sitting over 20-25' of water, are also good spots to throw a spinerbait. When fishing deep water docks some anglers will let the spinnerbait helicopter all the way to the bottom attempting to entice suspended bass. Once on the bottom, they will slowly roll, or a better description might be "drag", it out from under the dock. For this to work make sure you have a spinnerbait with quality swivels that allow Colorado or Indiana blades (preferred for this technique) to turn at very low speeds. "Deep water" here is considered as any 10' to 30' deep. Most bass caught on spinnerbaits every year are caught in water less than 6' deep because that's where most of us fish them. However, spinnerbaits are great "search" lures in deep water. Much better than a worm, jig or any other "slow" presentation. Furthermore, for those of us who fish "older" lakes where there is a shortage of shallow, woody cover and the bass move to deeper structure as a matter of routine, the spinnerbait can be deadly. Why? Because (1) spinnerbaits have a wide attraction area due to their flash and vibration, (2) they look more like baitfish than other lures, (3) can be slow-rolled, lifted-and-dropped or helicoptered, (4) can be fished equally well on the bottom or just above it and (5) they trigger agressive strikes from bass that might otherwise ignore slower baits. Weight is obviously important when spinnerbait fishing in deep water. 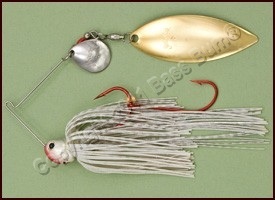 Heavy spinnerbaits weighing 3/4 to 1 full ounce or even heavier (1 1/4 - 1 1/2oz) are in order. The heavier the lure the faster the fall of course. But what about blade shapes and sizes? As for blades, the season and technique can influence the choice. In summer, when using spinnerbaits as "drop baits" in deep water, a 3/4 ounce head with a single willow-leaf blade on a "short" arm is the ticket. At least in my humble opinion. Why a single blade on a short arm? Because this combination results in a tight vertical fall and spin as the lure descends through the strike zone. But there is a problem. Few manufacturers make short arm spinnerbaits, at least as short as 1 1/2", which is the best length for this. So you must shorten the arm yourself by first removing the front blade and clevis and then clipping the shaft and forming a new loop to which you attach a swivel and blade. Don't try this with a titanium arm spinnerbait! You can't bend a new loop in titanium. If you're not "drop fishing" your spinnerbait, then tandem or single No. 4 1/2 or No.5 willow-leaf blades on a one ounce or heavier head for a fast fall and a 1/2 to 3/4 ounce head for a slower fall, will work well. If these create too much lift and cause difficulty in keeping the lure on the bottom, you can substitute even smaller blades. Make a long cast and let it flutter down through the strike zone to entice suspended fish before beginning your retrieve. Once you begin your retrieve the willow-leaf blade(s) will enable the lure to stay deep because they create less lift. This enables slow-rolling the bottom contour. When water is cold switch to a Colorado or Oklahoma blade(s). The stronger water resistance and thump of these styles makes it easier to fish slowly for sluggish bass. Make a long cast and wait till your lure hits bottom. Snap your rod tip to kick-start the spinning of the blades and start your retrieve. A lift and drop or yo-yo retrieve on a semi-tight line often draws strikes on-the-fall. Though much of what has been written above applies to spinnerbait fishing for largemouth don't think for a minute it doesn't apply to spinnerbait fishing for smallmouth as well.